Though we wanted to bring you a perfect board, there are a couple errors on the board that require modifications. We're really sorry about this, but the good news is that the mods are small, easy to make, and not very messy. There are also some minor issues that you should be aware of, that can save you some frustration when building the board. Because the board is packed so tightly (to allow it to fit into the 5.75 by 4 inch size), there are a number of components that are not properly marked. These are listed here. Please be careful when assembling the board, as there are several parts that look similar, but are in fact quite different. We have attempted to arrange the assembly steps and our packaging avoid similar appearance parts within each assembly step. This errata list applies to MP3 player board, marked REV A, near the top edge of the 84 pin PLCC socket. 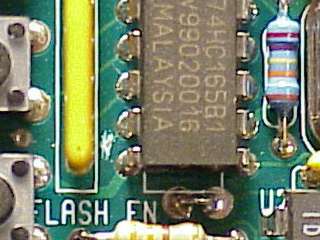 The trace between the 22k resistor network and pin 7 of the 74HC165 chip must be cut, to allow the CPU to access the flash rom chip. Trace Cut, Pin 15 of 74HC165, jumper to ground The trace between pins 15 and 16 of the 74HC165 must be cut. Pin 15 then must be connected to ground. 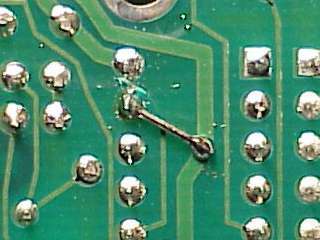 We suggest soldering a short wire between pin 15 and the ground trace that runs under the chip on the solder side. This ground trace has a via near pin 3. This modification is required to allow the firmware to read the pushbuttons. IDE Interface Missing Pin 1 Marking Pin 1 of the IDE interface should be marked on the board. On both connectors, pin 1 is on the end facing the SIMM. Pin 1 is labeled on the assembly diagrams. Now would be a good time to mark pin #1 on your board with a permanent pen, to avoid connecting a drive's cable backwards. The 44 pin header (Step 5) fits tightly. It can be tricky to insert this part, because the holes are so small. Do not apply excessive force, the part will press into the board without excessive force when it is aligned straight. The 1N4737 diode (Step 10) may need to have its legs bend slightly to prevent it from obstructing the SIMM socket. We suggest that you try to fit the SIMM socket while this part is in the board but not yet soldered, to verify that this diode will not prevent you from correctly inserting the SIMM socket. The location of these parts is not marked on the board. Two of these capacitors are located by each crystal. These parts are included in Step 2. This part is all over the board. The only indication of the location of the capacitors is an outline around each of the two holes for the part. There are 15 capacitors in the MP3 player (Step 4), and 9 in the power supply (Step 8). We suggest that you insert the 33 pF capacitors before these, because it's easy to place one of these where the 33 pF parts belong. The location of this part is not indicated on the board. Be very careful, not only is it directional, but it looks identical to the 4.7k resistor network. The 22k resistor network is located by the 6 push buttons. It is marked on the side with 8X-1-223. This side of the part needs to be facing the push buttons. This part is included in Step 2. Similar to the 22k resistor network, the location of this part is not indicated on the board. It is located by the 40 and 44 pin connectors. Be careful, it looks identical to the 22k resistor network. On the side of this part is the marking 8X-2-472. This part is included in Step 3. The location of this part is not indicated on the board. Be very careful, this part looks almost identical to the 10 µF capacitor. There are circles on the board indicating that one of the two capacitors should be inserted. The positive wire is marked for the capacitor. This part is included in Step 4 and Step 10. The location of this part is not indicated on the board. Be very careful, this part looks almost identical to the 100 µF capacitor. There are circles on the board indicating that one of the two capacitors should be inserted. The positive wire is marked for the capacitor. This part is included in Step 5 and Step 9. These two parts form a RC reset circuit for the 87C52 CPU, which was replaced with a MAX810 surface mount IC (Step 1) on the solder side under the CPU. The MAX810 offers better performance. The capacitor can physically obstruct inserting some SIMMs. MP3 Player Kit, Assembly Instructions, Paul Stoffregen.